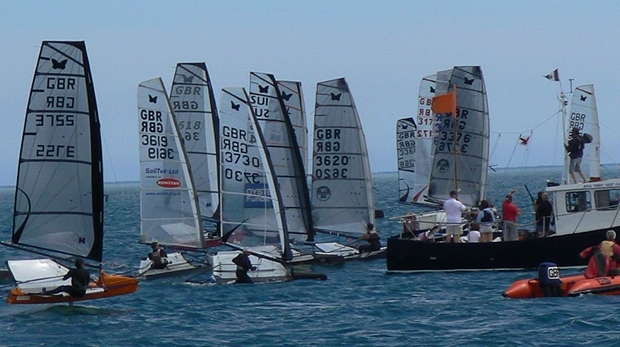 The 2013 Rolly’s Brownies International Moth UK & Open Nationals will take place at Castle Cove Sailing Club over 27-30 June with sailing taking place in Portland Harbour and Weymouth Bay providing a great mix of conditions to challenge the competitors. Back in the day when the foiling revolution took off Weymouth and Portland was nicknamed 'Foiltown'. We have those pioneers to thank for bringing foiling to the UK and being our crash test dummies in a class that has grown considerably over the last 10 years. The class will return to Foiltown at the end of this month for what could be a very close battle. Racing will be held over four days with three scheduled races a day and with a fleet of 50+ expected this will make it the most contested Moth Nationals ever. It will be great to see that two UK builders of Maguire boat with the Exocet and Aardvark with the new Rocket design (more on these here) can compete with the Moth builders from overseas - but who will win? Last year’s winner, Chris Rashley, must be the favourite. He has already won the Europeans this year, but he hasn’t had it all his own way with Mike Lennon pushing him all the way to the last race. Chris’s training partner and 2011 winner Jason Belben is sure to put in a fight to win the title back this year and let’s not forget Simon Hiscocks, who last year won the Newcomer award and has already won the first Moth open of the year he has to be a contender especially as Weymouth is his own back yard. These are just a few but there are now many past National champions, World and European champions that sail the Moth these days all of which have the ability to put together a winning series. But it’s not all about the front of the fleet there are many battles right through the fleet. And while we can’t predict the weather we can predict that with the kind support of many local businesses we will be well fed and watered! All sailors will be greeted off the water by post race beers being provided by Azure Logo Embroidery, Shock Sailing and Blueteq. The Commodore’s reception is being supported by Palmers Brewey and the Saturday night party will be one to remember being held at the Acqua Beach Hotel and Bar whose tapas and cocktails should set us up for a great night.